The TrekStor Primebook C11 achieves what only very few notebooks have achieved so far: It is both good looking and a price-performance winner. The main reasons for this are the long battery life and the very good touch display. The Primebook C11 is a visually and technically almost identical but smaller version of the Primebook C13. The Primebook C11 is not a standard notebook, rather it is much more flexible in application. It can be used as a touchscreen device if the user desires that, and it is also foldable through 360°. This function gives you a variety of different options. For example, it allows the device to be used as a tablet too, with minimum fuss. The workmanship of this laptop is good, and the only 16mm thick metal housing leaves a stable impression. 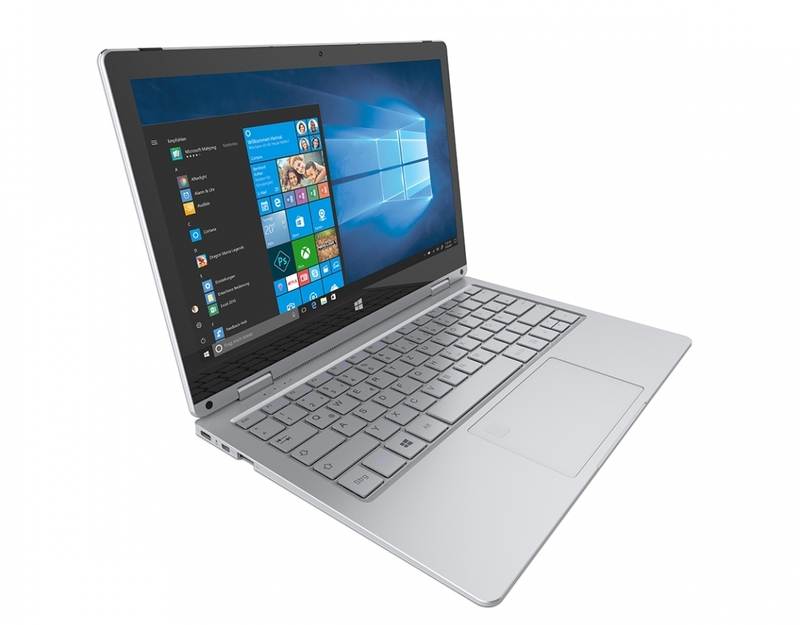 Beneath the compact aluminum case, users have an energy-saving Intel Celeron N3350 processor, which also ensures that users can work in peace and quiet. Furthermore, 4 GB of DDR3 memory and 64 GB of eMMC memory are installed. The performance is therefore only slightly above average; it is sufficient for everyday office and surfing tasks as well as occasional movie nights. The 11-inch device is somewhat easier to handle than the 13-inch model, which is most noticeable in tablet mode. The glossy Full-HD IPS display has a native resolution of 1920x1080 and offers great color space coverage. Although the surface still reflects, thanks to the improved maximum brightness (up to 251 cd/m²), outdoor work is much more pleasant. The display of the Primebook C11 is really worth a look for photo enthusiasts. The screen manages to cover over 90 % of the sRGB color space, so images should be rendered accurately. The keyboard scores with crisp back pressure, which is not self-evident due to the small stroke. The mouse replacement is pleasantly wide, has a roughened surface and does not stick. However, the fingerprint sensor is located in the upper left corner of the touchpad, which reduces the effective usable area. The touchscreen convinces both in the notebook and in tablet mode with a fast and accurate recognition rate. This is why there is no need to connect any conventional input devices to the convertible. In terms of ports, the Primebook C11 is limited to the bare minimum. There are three USB ports (2x USB 3.0, 1x Type C), and a fingerprint sensor to unlock the device. There is no HDMI port and no SD-card slot. Also missing is a classic LAN port. Therefore, a user can access the internet with the Primebook C11 only via the WLAN-AC module. The battery runtimes also invite longer trips. In normal usage with casual web browsing, the battery lasts about 10 hours. With continuous video playback, the battery can still last more than 8 hours. 78.72%: This rating is not convincing. The laptop is evaluated below average, this is not really a recommendation for purchase.